SuperDryPak-DS™ silica gel bags effectively absorb humidity and thus prevent moisture-damage and corrosion. They are comprised of British Standard (7554) beaded silica gel, and are compliant with Def-Stan 81-68/4. Used in many defence applications where moisture-damage is possible, our silica gel bags will prolong and maintain your product’s shelf-life. 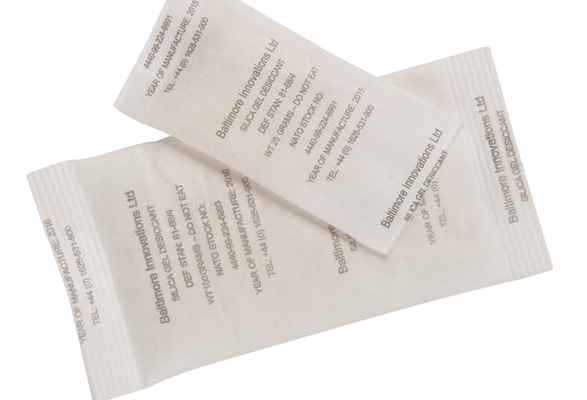 SuperDryPak-DS™ silica gel bags come in a full range of sizes from 5g to 500g – so as to offer you optimal performance. We work with the world’s largest Defence companies – so come and work with us ! Lead-Time …these are standard stock items, so the lead-time for delivery can be next day. For help with your Silica Gel Bags requirements specifically for the Defense sector or any other problems that you have, please give us a call on +44 (0)1628 531900.